The Tampa Bay Lightning are facing a major cap crunch after this coming season, and it poses a major problem in signing Nikita Kucherov. I visited a similar topic a few weeks ago regarding how the team can re-sign Steven Stamkos and the likely cap casualties that will occur, and the conversations around Stamkos have dominated the summer. However, signing Kucherov may be equally as important. Is it possible we could see a Brandon Saad situation with Kucherov next summer? It isn’t often you see a high-profile restricted free agent get moved rather than re-signed. However, the Chicago Blackhawks found themselves in a tight cap situation with little options but to move Saad to the Columbus Blue Jackets when they provided an offer that was hard to pass on. The Lightning, like many other teams after a run to the Stanley Cup Final, will experience the same type of situation at the conclusion of the 2015-16 season. When you’re dealing with a player of Kucherov’s level, it’s normally a smart decision to skip the bridge deal and lock him up long-term. It’s also important to begin talks sooner rather than later, as he’s all but guaranteed to add another stellar season and increase his market value even further. Especially if he finishes in the top ten in scoring. Comparatively speaking, players in the same realm as Nikita Kucherov are considered elite and are paid as such. Vladimir Tarasenko is probably the closest player in comparison to Kucherov, and he just inked a deal that carries a $7.5 million cap hit for the next eight years. 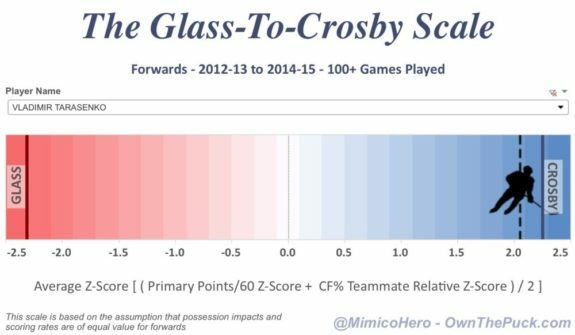 Take a look at Kucherov’s Glass-to-Crosby scale below, courtesy of ownthepuck.blogspot.ca. While it’s a somewhat humorous way of viewing production, the point is very clear on this scale. Crosby represents the best overall production in the league and Tanner Glass falls into last out of all NHL forwards using this formula. 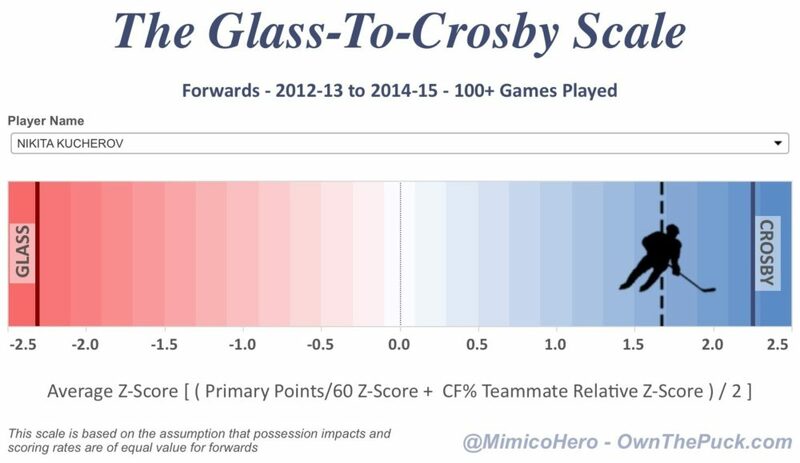 As you’ll see, Kucherov is extremely close to Sid when taking the last two seasons into account. 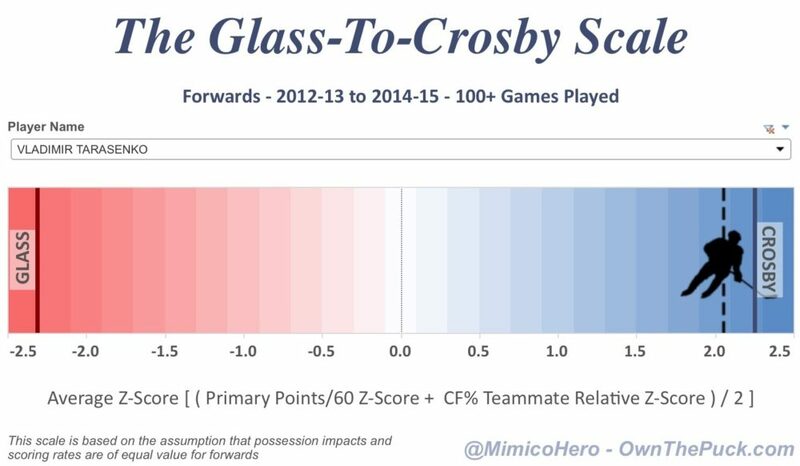 Let’s also take a look at Tarasenko’s Glass-to-Crosby scale. You’ll clearly see that their age and nationality aren’t the only similarities between these two youngsters. There’s a definite uptick in production, but the two are very close. I’d venture to say that Kucherov will fall in the $6.85 to $7.25 million range for six to eight years. So, of course the question becomes, can the Lightning afford him at that price? It won’t be easy, that’s for sure. It’s widely assumed that Stamkos will come in around $10.5 million, similar to Jonathan Toews and Patrick Kane. Let’s say Kucherov costs $7 million. Their raises will be $5 million for Stamkos and approximately $6 million for Kucherov. There simply isn’t an extra $11 million in cap space lying around in Tampa right now. It’ll be interesting to see how Steve Yzerman handles his first real cap crunch. Remember, Alex Killorn will also be a restricted free agent that Yzerman will need to qualify or trade. It’s a foregone conclusion that the 2016-17 Lightning will look much different from the squad we see this coming season. And, it’s very possible that the question of whether or not Steven Stamkos and Nikita Kucherov both remain will haunt us until next spring.